Ali Sharif Zu’bi Advocates and Legal Consultants, established in Nazareth, Palestine in 1921 by the late Sharif Ali Zu’bi, is a leading Jordanian law firm with a substantial international practice. We provide a full range of legal services in Jordan, the Arabian Gulf (through our associated office in Bahrain) and internationally through our connections and associations in other parts of the world. We offer a broad array of capabilities in virtually all areas of legal practice, and are heavily involved in most major transactions in Jordan, with a special emphasis on foreign investment, joint ventures, mergers and acquisitions, government and infrastructure projects, and privatisation, in addition to handling major commercial litigation and arbitration matters. Our firm's broad practice areas also include business and corporate, banking and finance, construction, employment and labour, and taxation. We take pride in the talent of our people, the depth of their expertise, and the teamwork employed in providing superior service to our clients. Our lawyers work together and across practice specialties to help clients anticipate and avoid problems, resolve disputes, and ultimately achieve our client’s legal and business goals. Whether a small business in an emerging industry or a diversified multinational corporation, each client represents an important relationship, to which we dedicate our best resources, attention, and service. Staying on top of legal and business changes is an important part of our firm’s approach. We have committed and knowledgeable partners who have been involved in many of the most important legal matters in Jordan, and who continuously pass on their knowledge and expertise to our associates. Our commitment to ongoing legal education and training, supervision, peer review, and total quality creates a forward-thinking environment that benefits every one of our clients. As our neighbouring country, Iraq has always been a natural market for our firm and in 2003, we expanded our practice by forming an Iraq Practice Group to assist clients in developing business opportunities in the dynamic and uncertain markets emerging in Iraq. Through this platform, we have been able to utilise our firm’s unique contacts and experience to advise clients on legal matters and investment opportunities across a broad range of sectors in Iraq. Our firm was founded on a commitment to ethical personal service and valued legal counsel; and after 97 years this has not changed. Born in Damascus in 1917, our former senior partner Ali Sharif Zu’bi, the elder son of the late Sharif Ali Zu’bi (the founder of our firm), was raised in Nazareth, Palestine. He was educated at the Jerusalem Law School and was called to the Palestinian Bar in 1943. He practiced for ten years in Palestine as a criminal lawyer and moved his office to Amman in 1953. The late Mr. Zu’bi was an experienced litigator and arbitrator whose practice was initially concerned with commercial contracts and litigation. 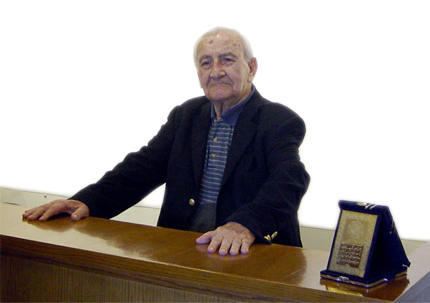 He has left behind a great legacy in his law practice that has steadily grown from a one-man law office in 1953 to one of the leading law firms in Jordan today. A seasoned cross-examiner, the late Ali Sharif Zu’bi will be remembered for his historical and memorable sessions in court that were witnessed by lawyers, advocate trainees and law students alike for over half a century. The late Ali Sharif Zu’bi was indeed a role model for many distinguished ministers, judges and lawyers in Jordan who completed their legal training under his supervision. He was the ultimate professional whose achievements will continue to be a source of inspiration for generations to come. The Legal 500 – Europe Middle East Africa, 2016 Edition. “This well-established firm has built up an excellent reputation for responsiveness, with one source describing its lawyers as ‘more responsive than most international firms.’"
Chambers Global – The World’s Leading Business Lawyers, 2016 Edition. IFLR1000 - The Guide to the World’s Leading Financial Law Firms, 2016 Edition. The Legal 500 – Europe Middle East Africa, 2015 Edition. “Ali Sharif Zu’bi Advocates & Legal Consultants serves a broad client base of investors and corporates from the Middle East and globally”. “This long-established firm is noted for its work in energy, banking and capital markets, and in the view of some clients, is ‘the best in Jordan’ ”. Chambers Global – The World’s Leading Business Lawyers, 2015 Edition. “Ali Sharif Zu’bi Advocates & Legal Consultants is one of the market’s most respected firms”. IFLR1000 – The Guide to the World’s Leading Financial Law Firms, 2015 Edition. “ ‘Probably the most international-facing domestic firm in the market’, Ali Sharif Zu’bi Advocates & Legal Consultants is commended for its ‘top-class knowledge and service levels’ ”. The Legal 500 – Europe Middle East Africa, 2014 Edition. “This ‘top firm’ continues to attract a range of heavyweight mandates, advising major names in the energy, banking and infrastructure sectors”. Chambers Global – The World’s Leading Business Lawyers, 2014 Edition. IFLR 1000 – The Guide to the World’s Leading Financial Law Firms, 2014 Edition. Chambers Global – The World’s Leading Business Lawyers, 2013 Edition. IFLR 1000 – The Guide to the World’s Leading Financial Law Firms, 2013 Edition. The Legal 500 – Europe Middle East Africa, 2013 Edition. IFLR 1000 - The Guide to the World’s Leading Financial Law Firms, 2012 Edition. “…praised by clients for its’ appropriateness of advice, depth of strength, and value for money”. The Legal 500 – Europe Middle East Africa, 2011 Edition. “One of the very top names in the Jordanian legal market”. Chambers Global – The World’s Leading Lawyers for Business, 2011 Edition. IFLR 1000 – The Guide to the World’s Leading Financial Law Firms, 2011 Edition. The Legal 500 – Europe Middle East Africa, 2010 Edition. Chambers Global – The World’s Leading Lawyers for Business, 2010 Edition. “Ali Sharif Zu’bi ‘is everywhere – they are the indisputable top law firm, ask anyone’”. IFLR 1000 – The Guide to the World’s Leading Financial Law Firms, 2010. “ ‘A well-established organisation with an impeccable reputation’ this law firm – the largest in Jordan – has a substantial share of the market”. Chambers Global – The World’s Leading Lawyers for Business, 2009 Edition. The Legal 500 – Europe Middle East Africa, 2009 Edition. IFLR 1000 – The Guide to the World’s Leading Financial Law Firms, 2009 Edition. “Ethical, efficient, professional and bilingual”. Chambers Global – The World’s Leading Lawyers for Business, 2008 Edition. "Ali Sharif Zu'bi is by far the most capable firm in Jordan". The Legal 500 – Europe Middle East Africa, 2007 Edition. "Jordan's premier corporate and commercial practice". IFLR 1000 – The Guide to the World's Leading Financial Law Firms, 2007 Edition. "Pre-eminent in Jordan, this firm has a knack for marrying international and local practice…comparable to international firms". Chambers Global - The World's Leading Lawyers for Business. 2007 Edition. "Not many firms have this calibre of lawyers". Chambers Global - The World's Leading Lawyers for Business, 2007 Edition. "Ali Sharif Zu'bi & Sharif Ali Zu'bi is Jordan's leading law firm on corporate finance matters with the most impressive list of clients and roles on just about every big transaction in the country". IFLR 1000 - The Guide to the World's Leading Financial Law Firms, 2005 Edition. “The only truly internationally-oriented firm in Jordan is visible on the country’s biggest corporate and project finance deals; with 25 lawyers it is the largest firm in Jordan". Chambers Global – A Guide to the World’s Leading Lawyers, 2004 Edition. “Ali Sharif Zu’bi and Sharif Ali Zu’bi dominates the legal scene in Jordan across a range of practice areas. With over 20 lawyers, the firm is the largest in the country, enabling it to win more of the big, high-profile deals than some of its highly regarded but smaller rivals". IFLR 1000 - The Guide to the World's Leading Financial Law Firms, 2003 Edition. “Ali Sharif Zu’bi & Sharif Ali Zu’bi undoubtedly still top and judged by peers to be ‘doing a great job in privatisation; the firm also has an established record in banking and M & A". Chambers Global – A Guide to the World’s Leading Lawyers 2002-2003. “Widely viewed as the leading firm in the country, Ali Sharif Zu’bi & Sharif Ali Zu’bi has had a part in almost every significant transaction in Jordan in recent years”. The Middle East & North Africa Business Guide 2001/2002, published by White Page in association with Morgan Stanley. The firm is actively involved in helping others and giving back to the community by doing pro bono work for a number of worthwhile concerns in the health care and educational fields. These include the King Hussein Cancer Centre, King’s Academy that was recently established by His Majesty King Abdullah II Ibn Al Hussein and the International Academy of Amman founded by Her Majesty Queen Rania Al Abdullah. The firm has established a legal aid fund in the name of our late senior partner Ali Sharif Zu’bi. Administered by the Justice Center for Legal Aid, it is the first fund of its kind in Jordan to provide pro bono legal services to those in need.